Born Joseph Melchior Sarto on June 2, 1835, this remarkable man described himself in his will, “I was born poor, I lived in poverty, I wish to die poor.” His place of birth was the little village of ‘Riese in northern Italy. His parents had nine other children, two of whom died in infancy. When the father, a cobbler, died, the mother supported herself and the children by the work of sewing and the products of the small farm. Joseph Sarto after attending high school went on to the seminary at Padua and was ordained in 1858. Among the outstanding works of his pontificate was the permission for children to approach the Eucharist at a tender age, and the general encouragement given to all with the proper dispositions to go to daily communion. From his youth unto his dying hour, his life of deep inner prayer reflected in his countenance. 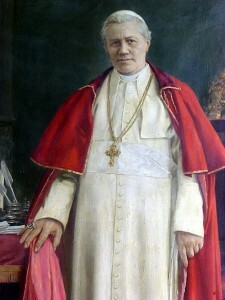 His papacy lasted until 1914 when at the outbreak of World War I, which he had foreseen, he went peacefully to his reward. At once, he was revered by priests and people alike as a saint. Finally, the almost universal acclaim of his holiness brought his beatification through the usual process in 1951, and he was canonized by Pope Pius XII on May 29, 1954. Reflection: Our Christian life is centered about the Eucharist. If we bring to Holy Communion the spirit of piety of St. Pius X, this source of grace will be for us a veritable tree of life, providing health, nourishment and strength for our souls.